121: Will The Real Braves Team Please Show Up…. 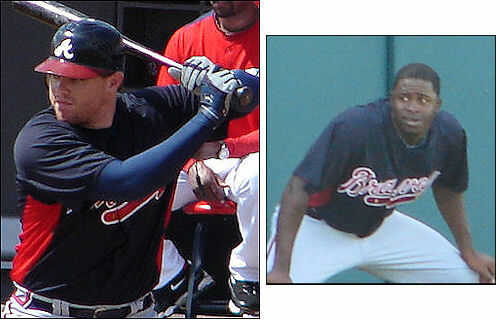 So, a little more than a month has passed and we have seen two very different Braves teams. The first was a world beater, rolling off a 12 win/2 loss record before running into a buzz saw of a road trip. Perhaps it was the idea of playing in an environment more suited to ice hockey than baseball that was the killer but since that stellar start, the Braves have looked very average. Perhaps we expected too much before the Atlanta team came back to earth in the heady first two weeks of the season. Routing the Nationals to open their home stand gave credence to the fact the Braves liked home cooking but suddenly the Nats bounced back and took the last two games of the series to earn a split. Then the Mets piled it on, snatching away an almost certain victory for the Braves by doing something no one else has ever done: hitting home runs off both O’Flarerty and Kimbrel in the same game to tie before scoring the go ahead runs in the tenth. Perhaps we should all take a step back and realize the old adage of “It ain’t over til it’s over” is more true in baseball than any other sport. Rookie sensation Evan Gattis is perhaps human after all and Justin Upton will not hit 72 home runs this season. At least there appears to be some rays of hope with Dan Uggla heating up and BJ Upton at least playing a great centerfield. Now, if only his bat can speed up to get wood on those fast balls he has been futilely waving at for the first month of the season, that big contract won’t look so bad. Chris Johnson may have cooled a little but Freddi Freeman is showing signs of heating up. The return of Brian McCann should provide a spiritual lift for the Braves. It is not just that he can hit but it is when he hits that has made him such a valued player in the Braves lineup. Nothing should be taken away from the surprising performance turned in so far by Evan Gattis but BMac is still one of the best catchers in the majors. A perennial All-Star until his balky shoulder diminished his production last season, Brian by all accounts appears to have returned to form. The combination of this being a contract year and the fact he should get a little more rest at the back stop position should translate to a Brian McCann we have not seen since his arrival in the Big A. That being a guy who is able to maintain his bat speed into the months of September. All that said, the Bravos have a pretty tough road trip ahead. Then again, if you want to be the best, you have to beat the best. GO BRAVES!! 120: Well, two weeks down, thirty three to go. With the first two weeks of the season behind us the Braves have shone they can play, making use of a lot of tools, while not yet at full strength. The Braves have been resilience being able to plug in their bench. This can work in the short term but the long haul is different, for one thing, it weakens the bench which has happened before. What you do not want to happen is to have to play for extended periods using your number two and three guys. In today’s world, advance scouting is a lot easier with so many games being aired over TV. While nothing can beat eyes-on in-person reports when scouting a team and players, being able to review a pitcher or hitter to determine tendencies is far and away easier when you can repeatedly hit the rewind button. But back to facts, the Braves have been able to follow the old school baseball philosophy of beating up on the weak teams while playing the good teams at least even. This week, the Braves beat the Marlins, the Houston Astros of the National League, although that is a bit unfair to the Astros, they at least have a plan. Anyway, they have beat the Marlins, the Cubs, have taken on the Nationals and swept them all. Everyone’s favorite bet to play in this year’s World Series is the Nationals but the Braves are in control of their own destiny. Soon, Freddie Freeman will be back and Brian McCann will return with a mission. Maybe the Braves will not be able to afford BMac in the future but there will be a lot of deep pocket American League teams and, perhaps even some in the National League, who will be willing to make sure Brian’s grand children will never want for anything. The key, however, is still “good pitching beats good hitting”. Bad pitching is revealed for what it is. Friday night’s game was a classic for Braves fans. Down early and in danger of being blown out, catcher Gerald Laird walked out to the mound after Teheran gave up the fourth run in just the second inning and calmed the rookie with the words of wisdom to buckle down and keep the team in the game. We had seen this same type of melt down before with Mike Minor when he simply gave up after allowing early runs. The change was dramatic: no more hits, a few quick outs and Teheran showed everyone the promise he holds for the Braves organization. While Detwiler mesmerized Atlanta hitters for seven innings, he was relieved be a heretofore reputed strong Washington bullpen. Suddenly the National’s pitchers couldn’t find the strike zone and allowed the Braves to tie the game by the ninth and with the Nats’ newly acquired closer Rafael Soriano unavailable after closing three straight games against the White Sox, Drew Storen gave up a two run homer to the Braves’ latest surprise hero Ramiro Pena in the tenth inning. Craig Kimbrel nailed down the save while facing the heart of the Washington batting order. The net result was a shock to the Washington Nationals and a boost to the mojo of the Braves. ball. While it was only a two run homer, Tim Hudson made it stand up and actually out pitched the young phenom. The Braves added an insurance run in the ninth and young Kimbrel slammed the door shut the second straight night. It was not until Sunday that the Braves best pitching performance was turned in. Paul Maholm turned a gem, mixing an occasional fastball with an assortment of breaking pitches to keep the Washington hitters off balance. The same could not be said of Gio Gonzalas as the Braves hitters feasted on nearly every mistake he made. It is still early days but the Braves have sent a message they are the real Beast of the East this season. There is lots of baseball yet to be played but one wonders how the return of Brando Beachy, Freddie Freeman and Brian McCann will affect this club. I’m thinking it will make a strong club even stronger. Woo hoo.. I can hardly wait. As we all watched the Braves fall to the Redbirds with a resounding thud in the first ever Wild Card playoff game, many of us were left with a very empty feeling of so much promise left unfulfilled. Everything appeared to be lined up in favor of the Braves. Outstanding pitching staff, rock solid bullpen and some timely hitting albeit somewhat sketchy when it came to getting guys home from scoring position. What we did not expect was a rock-slide defense would suddenly look like the Saturday Tee-ball league. The net results is an end to a season long before we were really ready for it to stop. Oh well, it is done. Over. Kaput! Time for us to turn to the all important topic of what to do next? The obvious answer is what is needed to build a team who will be playing beyond the first round in 2013. All the while knowing the other teams in their own division will also be stronger next season. Having deep pockets does not always translates into success but it sure does make it easier to rebound from a mistake. I look at the Braves as needing two major pieces and several minor ones to shore up their bench. First, someone to replace Chipper Jones. That is going to be a tough chore in itself. More likely, the Braves will to acquire several parts in order to make the whole. Hall of Fame type players do not grow on trees but when you look at the Cardinals, you can see how it’s done. Albert Pujols is perhaps one of the top five ball players in either league. St Louis managed very nicely by picking up Carlos Beltran. Beltran does not play the infield but he gives the Cardinals the same type of presence in the line up that Albert did. Far too often people become fixated by position when looking for players. What the Braves really need is a player who can provide a threat to produce RBIs in the middle of the line up and then find a position for him to play. So many folks have suggested Martin Prado be moved back into the infield to play third but forget that Freddie Freeman came up as a third baseman and was moved to first because the Braves felt this was an area of greatest need. I think what this gives the Braves is a bit more flexibility when looking for a power hitter in the middle of the batting order. My thoughts are more to whether or not Brian McCann is able to return to form. The absence of his bat was telling this season. Centerfield/leadoff might be a bit more tricky. The Braves have been looking for someone to fill the lead off spot ever since Rafael Furcal left for Los Angeles. Pure speed is not the only criteria needed. Patience to see a lot of pitches and knowing how to get on base is critical. It is a role I see Andrelton Simmons growing into pretty easily. He certainly is wasted batting in the eight hole. Raisins suggestion of trading for Dexter Fowler is an excellent one and if the Braves front office is still taking the advice of the old B&S as we have seen in the past, one which we may see happen this fall. Yes, it would be nice to see Michael Bourn continue to patrol the outfield for the Bravos but Frank Wren is more likely to follow the Florida Marlins model of baseball acquisitions than the one employed by the Yankees. The Braves will make a one year qualifying offer of $12 million necessary to get a compensation pick but Bourn is headed north to either Washington or Philadelphia or west to the Dodgers. It’s been nice having him around but alas, the Braves are just not prepared to overspend for a guy who has shown he can break down over the 162 game season. At least not one who has played in the organization for 19 years. Mechanicsville, VA – For a lot of folks, Freddi Freeman’s early season struggles had some wondering if this rookie was indeed ready for “Prime Time”. Could the Braves really be so lucky as to pick another one-two punch out of the first year draft in Heyward and Freeman? Looks like the answer to that question has been answered with a resounding “YES”. Perhaps the most pleasant surprise has not been his prowess with the bat as he is still adapting to big league pitching but with his nifty glove work around the bag. At least a dozen or more throws by various infielders have not been recorded as throwing errors but as outs because of his quick reflexes and long stretches for some pretty close tags. In the next to the last play of Sunday’s final against the Giants, he almost completed another amazing hook up with Alex Gonzalez that would have resulted in a final out that would have made the “Web Gems” for sure. The kid has displayed a deft touch that not only gives the Braves’ pitching staff the confidence to pitch to contact but also allows the other infielders to not worry about having to be too fine with their tosses to first. The Braves have had a revolving door at first base over the past twenty years. In fact the only real mainstays have been in the pitching corps, at third base with Chipper and in centerfield for the ten years that Andruw Jones occupied the spot. While the Braves have employed some really great first baseman in the past with the likes of Andres Galarraga and Fred McGriff, it has more often than not been the position of necessity filled with players like Sid Bream and Gerald Perry with a few years of Adam LaRoche and Mark Texiera thrown in. Rather than having a guy around whom you could build a franchise like a young Derrick Lee or Albert Pujols, the Braves filled the slot with the likes of Scott Thorman and Randell Simon or converted past-their-prime third basemen like Troy Glaus and Ken Caminiti. Freeman has a long way to go before he reaches his full potential as a hitter. To get anything above .270 from a rookie in his first full season is always a plus but Freddi has shown flashes of what we might come to expect. He is a big strong player who “gets it” and does not always try to pull every pitch but has enough power to drive the ball the other way and is willing to take what the pitcher is giving him. For sure, just squaring up on the ball and hitting it hard somewhere appears to be the MO of this kid rather than being pull happy which results in a lot of weak ground balls to the second baseman. While those majestic, towering big flys into the bullpen can inspire a lot of oohs and ahhs, it was the line shot to left center that made me really sit up and take notice. That is the sign of a player who is not trying to hit a five-run homer but one who is trying to make solid contact and has enough power to hit them out to all fields. It is a welcome sight to an old Braves fan like me to see the Braves bring up a homegrown player who is likely to become an everyday fixture on the line-up card. There are a lot of All-Star first basemen playing in the majors right now if you only consider their bat but very few are the total package of being MVP type players with both the glove and the stick. It is my most humble opinion that Freddi Freeman is a player with that same potential. For sure, he is going to be at the top of most every writer’s ROY list by the time he has made the rounds to different cities. As for hitting, he is yet another young player who “gets it”. Let’s be honest folks, anything above .270 for a first-year rookie is really gravy. He has shown power but he also has shown that he understands that he does not have to try to pull everything to right field. 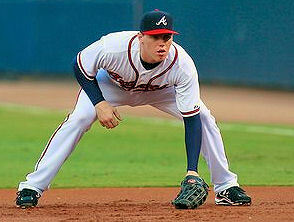 I don’t expect to see any radical infield shifts as we have on players like Brian McCann or Ron Howard of the Phillies. He will have his share of O-fers this season because he is a contact hitter who is still learning the game but he is only going to get better with the stick. Viera, Florida – Greetings all! While I touched on a few highlights about the game between Atlanta’s split squad and the Nationals in the previous post, I thought I would elaborate on some of my other observations. First would be the noticeable difference in Nate McLouth. Honestly, it is nearly impossible to accurately describe the difference in the player I witnessed last year in camp and the one I saw Friday. It is not just the fact that he is hitting the ball the other way. Where he was not making contact at all last year, he is now striking the ball with authority and without that exaggerated uppercut he has employed in the past. Being a bit smallish in statue, McLouth is not a prototypical home run hitter to begin with. He is, however, exactly the kind of guy you would want at the top of your line-up if he can get on base because he has great speed in addition to good base-running smarts. Having guys like Schafer and McLouth available as table-setters for boppers like Chipper Jones, Dan Uggla and Brian McCann add so many possibilities to the Braves offense. In addition, having a speed guy on base increases the likelihood of the latter seeing more fastballs and can be a huge distraction for opposing pitchers, increasing the probability of mistakes. McLouth is also throwing the ball with greater ease. Though I do not know the reason for the change and the big difference, I can only speculate that perhaps he was hampered by some type of injury last season. Other players I observed who stood out were Brandon Beachy, Diory Hernandez, Freddi Freeman and Shawn Bowman. Beachy was peachy. He had the National hitters off balance during his entire 3 inning stint. He has a lively fastball which is complimented by a plus-change. National hitters were doing the bunny hop trying to adjust for his change of pace pitches. The only exception was Ed Merero who guessed right on a fastball and hit a ringing double down the left field line. Diory Hernandez looked sharp both in the field at short and with the bat. He is starting to reach the age where the term “prospect” no longer applies and will either make it or not at this juncture. With the trade of Infante’ to the Marlins, he has the perfect opportunity to move into a super-sub role. While he is mainly a shortstop/second base type of player, he has also taken a few turns at third and could play there if called upon. Diory’s real shortcoming has always been trouble hitting major league pitching. He has shown the ability to hit at every other level he has played so perhaps it is now just his time. I believe the biggest difference may be in his confidence level. Spending some time with the big club last season may have allowed him to realize that he belongs at the major league level. While he has pop in his bat, he also has gap-to-gap hitting skills and very good speed. He is going to stretch a lot of doubles into triples. On Friday, he and Brooks Conrad turned two double plays against the Nationals. While not called upon to make any spectacular plays, he made the plays he was supposed to make and that in itself could be a small victory. Kudos to Brooks Conrad, too, by the way. He made a couple of very nice plays in the field and executed the pivot position at second with authority. Freddie Freeman plays at a level that belies his young age. He displays excellent glove work in the field and outstanding baseball sense when it comes to situational hitting. It is so frustrating to watch many young – or old for that matter – players who possess power but who will always be swinging for the fences regardless of the circumstances of the at-bat. How many times have we seen players go for the glory only to be struck out because the opposing pitcher knows that a power hitter’s weakness is change of speeds. While we know that Freeman processes power, he can also hit to all fields and seems content to hit the ball the other way. It is a lot harder to pitch to a guy who will hit the ball where it is pitched than to a player who is always trying to pull the ball. One of the most difficult things for a first year player to do is to hit above .250. It is just the nature of the game for a young guy to adjust to big league pitching because major league pitchers will get the book on you pretty quick if you have a weakness. Remember Jeff Francoeur? He would punish any pitcher who threw him a strike until pitchers quickly realized they did not have to throw a strike to get him out. I’m not saying opposing pitchers won’t strike out Freeman but they are going to have to throw strikes to do it. 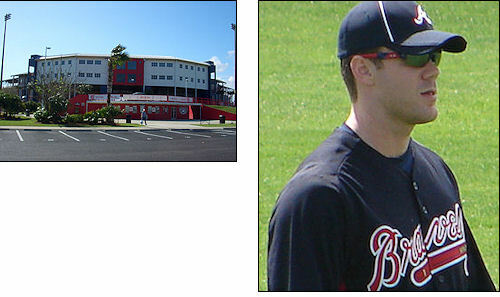 One last comment on Shawn Bowman – a young kid who plays third base – who will not likely be playing in Atlanta this season unless things do not go well health-wise for the club. He is a good looking prospect with a decent glove and is a good hitter. Again, not a guy who is trying to do too much but appears to know what he is doing in the batter’s box. 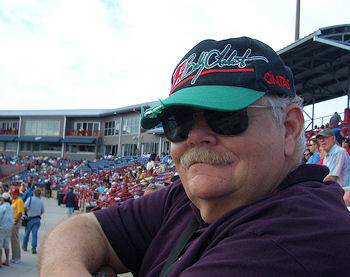 He has been a late-inning substitute this spring and I expect he will begin the season playing third-base in Gwinnett. Keep an eye on him though because he will definitely be playing in the big leagues somewhere one day.